I could write you a summary, but the title says it all: this is a book about Jane Austen's life. As much as anyone can tell about it years and years after she died. I love Austen's books. 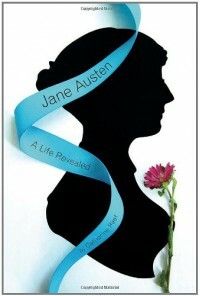 If you've read some of my Top Ten Tuesday lists you probably know how much I love Jane Austen. And Pride and Prejudice in particular. I've read it countless times and watched the movie so many times I practically know it line for line. Which is why I'm a bit ashamed to admit I didn't really know that much about the author herself. And come to think of it, I don't really know that much about authors in general. I did know Austen never married and that she died at the age of 42 from an unknown illness. I loved, loved, LOVED learning more about this woman who wrote such incredible books! It makes it feel more personal and probably made me love her even a bit more. It's sad that so many of her letters were burned or censured. And it really makes me curious to know what was in them that caused them to be burned! What kind of dirty little secrets were they hiding? I don't think we'll ever find out, it adds a sort of mistery to it all. The book was really well written in my opinion. I don't read a lot of non-fiction and think biographies or memoirs can get stuffy and a bit boring if you're not careful. This was a really readable biography, I felt like it was more of a story than a summing up of facts, which I really appreciated. One thing I have to say that I didn't like so much: there were lots of pictures in the book, and while I enjoyed those, most of the time they had literally nothing to do with the part of Jane's life the author was describing. I thought they were a bit awkwardly placed and because they didn't add to the part I was reading, they were kind of distracting. Apart from that, I really enjoyed the book and can now proudly say I know more about my favourite author!